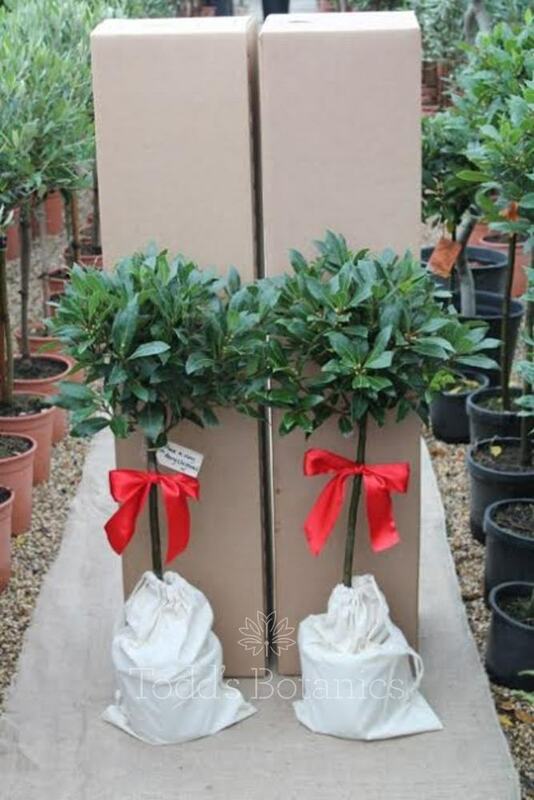 A pair of beautiful standard bay trees with evergreen aromatic foliage. Deep glossy green leaves, a shaped quarter standard tree with a rounded head. 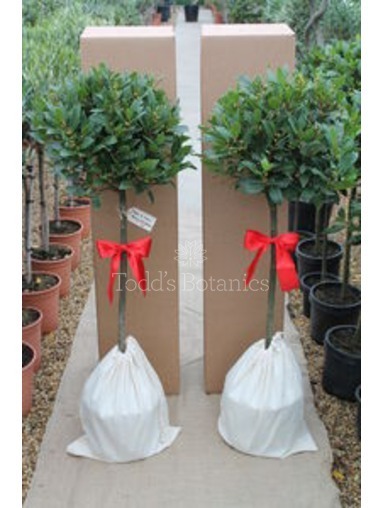 These fantastic bay trees look great flanking a door or pathway; we always dispatch these as a matching pair. Sourced from the best bay grower in Belgium. 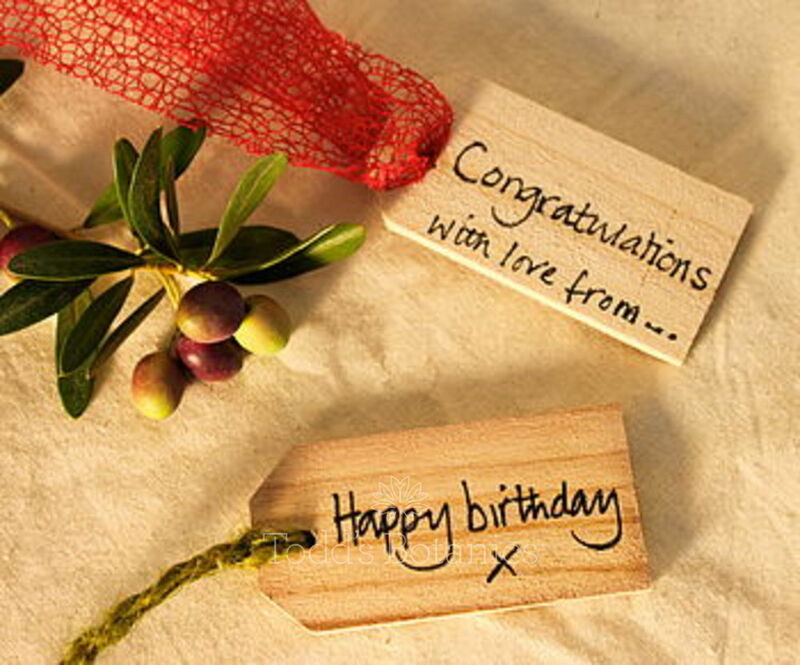 An ideal gift which can also be used for cooking! 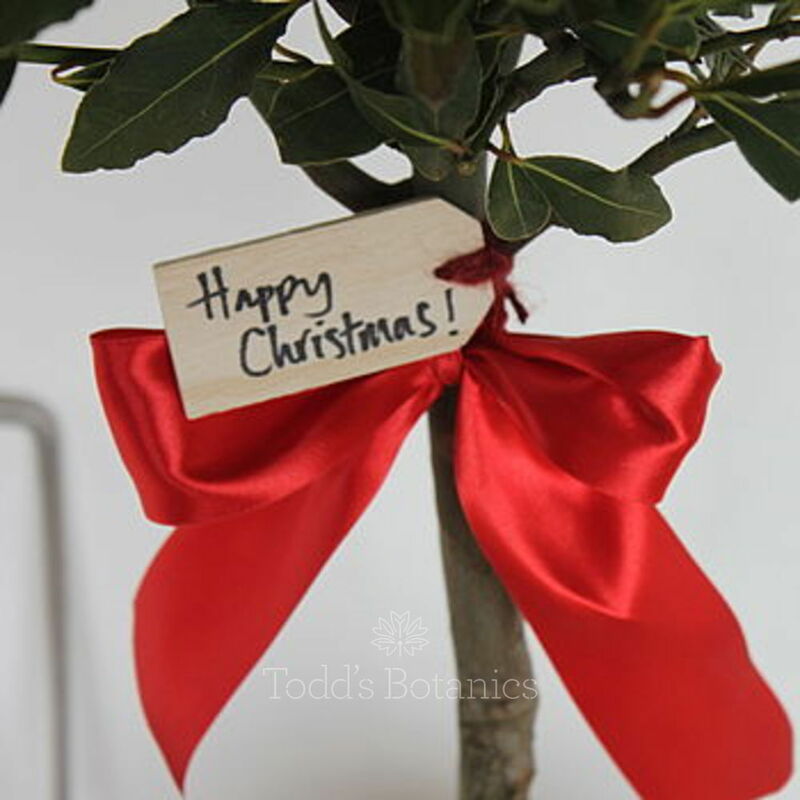 Full care notes included with every order detailing water and feed requirements, prunning and any other specific care. We love to make it easy for you! Best suited outdoors, in full sun or part shade, ground or container. 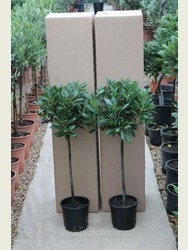 Our bay trees are available in many different sizes. 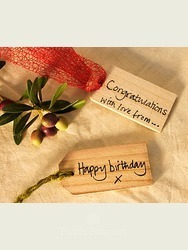 We handwrite any personal message on to a beautiful wooden gift tag threaded with jute string. 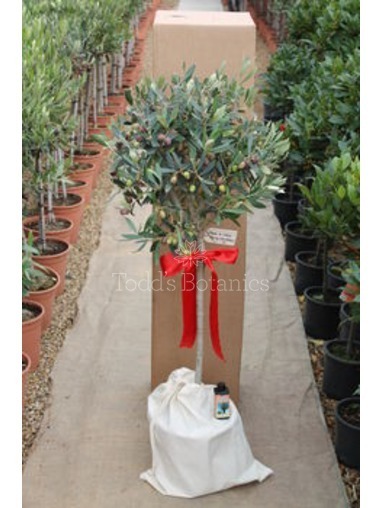 Your plants are then placed in reusable calico drawstring bags and decorated with red satin ribbon. The gift is delivered in a stout cardboard box. 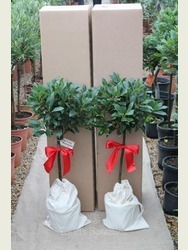 A beautiful pair of bay trees makes a lasting and memorable gift. Box and bay topiary is suitable in full sun, part shade or full shade, watering just needs to be adjusted accordingly. A sheltered site best suits bay in winter, as it is less resilient than box in a very hard winter. Box and bay both suit all soil types apart from waterlogged! In a container, a soil based compost such as John Innes No.3 with added organic matter and coarse grit to aid stability and drainage would be ideal. Box balls, pyramids and spirals for sale, best in the UK and fast delivery, Click here. 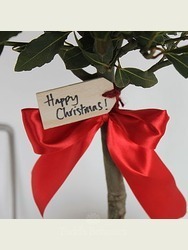 To buy Bay trees, standards, lollipops and cones Click here. 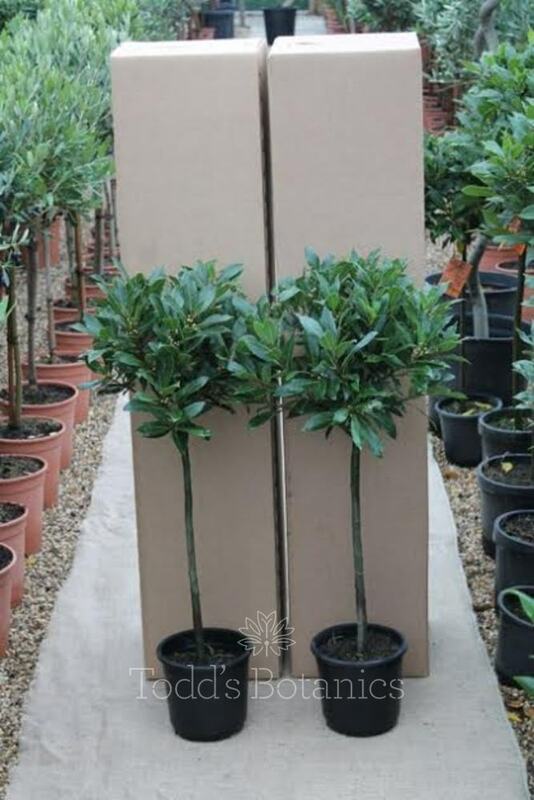 Containerised topiary plants rely on you for all their feed and watering requirements. 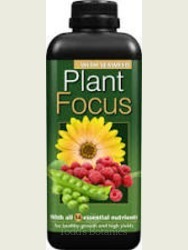 Feed with a general purpose fertilizer such as Vitax Q4 once a month from Apr-Jul. Discolouration of foliage is usually due to lack of feeding - white or orange tips on box indicates potassium deficiency, as does an overall bronzing of the foliage. In both instances feed with Vitax Q4 regularly spring-summer. In bay, yellow leaves would likely indicate a lack of feed too. As a minimum, prune topiary during early June then again in October to shape it up ready for winter. Alternatively, trim little and often throughout the growing season. It is important not to trim box in hot weather otherwise the cut edges can scorch. It is best to trim bay with secateurs to avoid unsightly cut leaves that will turn brown. Topiary shears or a small hedge-trimmer are ideal for trimming box to shape. Don't rely on rainfall to water containerised topiary; the foliage is so dense that little, if any, rain would reach the soil. Water container grown plants throughout the growing season (Apr-Sept). The frequency depends on the sun/shade situation of the plants and the weather conditions. The symptoms of drought for box are the new growth turning blue and wilting, and the older growth turning yellow/orange. On bay, wilting of new growth is easier to spot. Waterlogging can also be a problem if the container does not drain between watering or sits in water. On bay, low numbers of yellow leaves is part of the natural shedding process; these can just be picked off if too unsightly. However, if an excessive amount of yellow leaves appear this can be a symptom of waterlogging; check the compost. Black leaf spots on bay also signifies waterlogging, or old, tired compost, re-pot removing the bottom third of compost by gently teasing out the root ball and also the top 5cm of the compost. 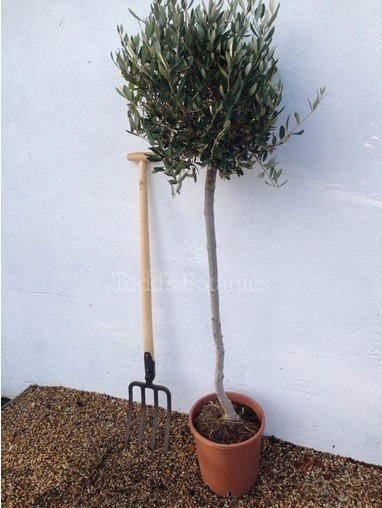 The roots can also be lightly pruned to aid re-potting. Containerised topiary can be susceptible to a frozen rootball in a very hard winter if the pot is relatively small, ideally move to a sheltered position. Be careful not to trim topiary too early in the season as new growth is very susceptible to frost damage. Late May/early June is ideal for the first trim of the year. Bay are more susceptible than box to winter foliage damage, a sheltered position will help to minimise this. 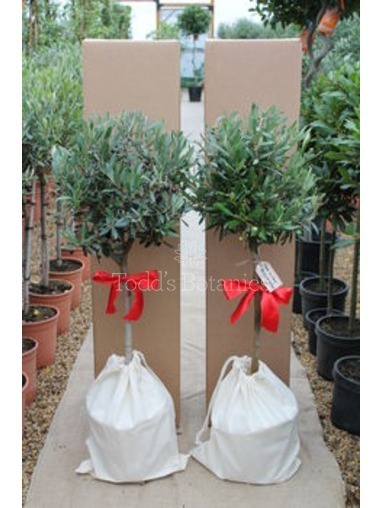 Pair of 1/2 Standard Gift Wrapped Olive Trees Make an entrance!